The first F/A-18 Hornet display of the year is always the Australia Day show over the crowd around Sydney Harbour but, unlike last year’s blue sky day, this year was the opposite with rain and low cloud. All morning the team from 2OCU kept checking the weather to see if the display would still go ahead and by the time the call had to be made it was decided to proceed . Taking the low level run down the coast to form up just outside Sydney Heads the 3 ship formation headed in to time their run for the break to be at the end of the national anthem. This year, due to a new display pilot getting ready, the 3 Hornet’s did a different routine to last year, so come on-board for the action with the Aircraft which did the quick laps around the harbour. Remember you can move the view around in the video as it’s a 360video. After the short display over the harbour the team headed back up the coast line to form up once again to fly over the city of Newcastle and Nobby’s Beach. RAAF F/A-18A Hornets Australia Day 2017. 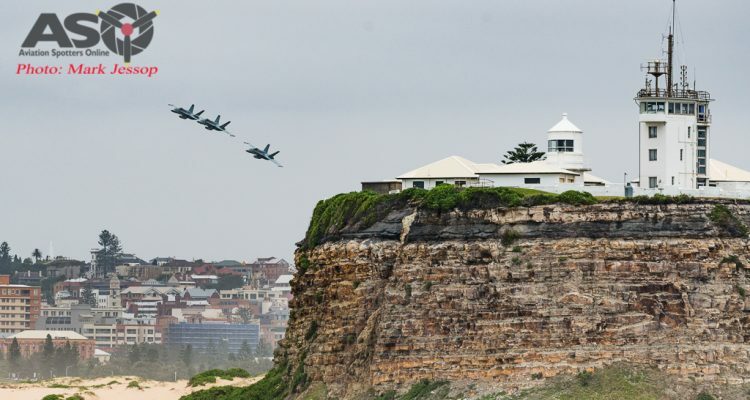 RAAF F/A-18A Hornets Australia Day 2017 coming in over Nobby’s Beach. While the conditions on the day weren’t the best it was good to see the team in action- Mark.